Many third-party media services (YouTube, Twitter, etc.) provide a snippet of code which can be embedded into your content using the WYSIWYG. The media becomes part of your published page which website visitors can view and interact with. 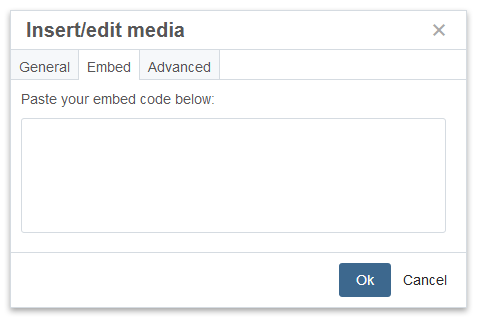 The steps to embed media from most third-party services are the same, however obtaining the embed code is different for each service. First, obtain the embed code, then proceed with the steps to insert it. And to ensure that we all read the fine print, familiarize yourself with the Terms & Conditions for using third-party services. Important! Don't use your personal account. Some services require an account for use. Do not use a personal account (unless you want to share login info with your boss!). Instead, create an official department account and share the login with others in the department as needed. Below are the most popular third-party media services used on CMS sites and links to instructions for obtaining the embed code for each service. Example of an embedded YouTube Video. Note: Additional web form options are available. The Insert/edit media window provides a method of pasting third-party embed code. Note: The settings in the General and Advanced tabs are not necessary to configure and may be disregarded. The software may facilitate your access to websites maintained by third parties offering goods, information, software, and services ("Third Party Online Service(s)"). Your access to and use of any Third Party Online Services is governed by the terms, conditions, disclaimers, and notices found on each site or otherwise associated with such Third Party Online Services. Carnegie Mellon University does not control, endorse, or accept responsibility for Third Party Online Services. Any dealings between you and any third party in connection with a Third Party Online Service, including such party’s privacy policies and use of your personal information, delivery of and payment for goods and services, and any other terms, conditions, warranties, or representations associated with such dealings, are solely between you and such third party. Refer to Click Through Agreements & Software for third-party services not included on this page. Can I embed my own media instead of using a third-party service? For advanced website managers with coding knowledge, you may use your own embed code if you prefer not to rely on a third-party. However, there is a limitation to what can be embedded; for example, the 200 MB file size limit in the CMS is unlikely to accommodate large files such as videos, so we recommend using a third-party media service whenever possible.